TEMPE, Ariz. — Shohei Ohtani hopes to hit off a tee next week for the first time since Tommy John surgery. "That's the thought, but I'm not trying to rush myself," the two-way Los Angeles Angels star said through an interpreter Sunday. The AL Rookie of the Year had surgery Oct. 1 to repair a torn ulnar collateral ligament, and the Angels think the earliest he could be ready to hit in games is in May. The 24-year-old hopes to start the pitching phase of his rehabilitation at the end of spring training. 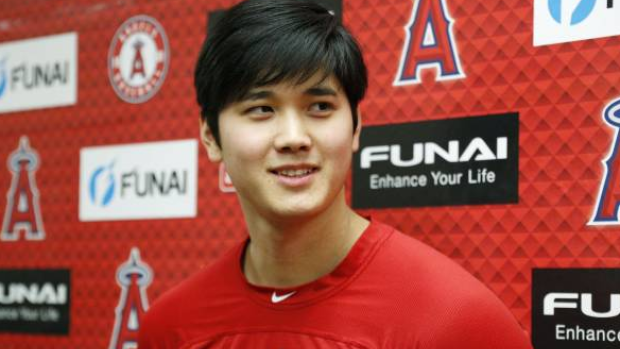 "So far, things are going as planned," Ohtani said. "No problems at all. But maybe once I start throwing, maybe I'll start having some issues. But as of now, everything has been going well." Ohtani went 4-2 with a 3.31 ERA in 10 starts as a pitcher. He played 104 games overall as a rookie, hitting .285 with 22 homers and 61 RBIs. "Physically, he's a once in a lifetime type talent," new Angels manager Brad Ausmus said. "Now if we can get him back to where he was at the start of last year, it'd be perfect. The fans love to watch him, we love to have him in a uniform." What has Ausmus learned about Ohtani so far? "I can say this, he's intense for sure," Ausmus said. "He seems to have a good sense of humour but when it comes to baseball, it's almost as if he's on a mission." The Angels have another two-way player on their roster in Jared Walsh, who is a left-handed reliever and plays first base and the outfield. Ohtani has said hello but hasn't talked much to Walsh. "It wasn't one of my goals but it is a good thing if people start doing it because of me," Ohtani said. "Right now, I just need to focus on myself."